Callum Hudson-Odoi is a player that derives significant attention from important teams. A product of Chelsea’s academy, the forward has been questioning his role in the team. Bayern Munich has replied to his predicament offering Hudson-Odoi the chance to play in the Bundesliga. Why are two of Europe’s most important clubs showing such interest? Today we analyze his recent stats and look at his strengths and weaknesses. Even though the Englishman has made few starts for Chelsea’s senior team, he has usually made his chances count. This season Hudson-Odoi has netted in both the Europa League and the FA Cup. His few appearances in the Premier League have shown him capable of leading Chelsea’s ailing attacking line. Simply put, scouts believe that there are few players of Hudson-Odoi’s age and potential on the market. This has lead to Bayern showing a willingness to spend in excess of £35m to secure his services. Chelsea, on the other hand, is not budging. 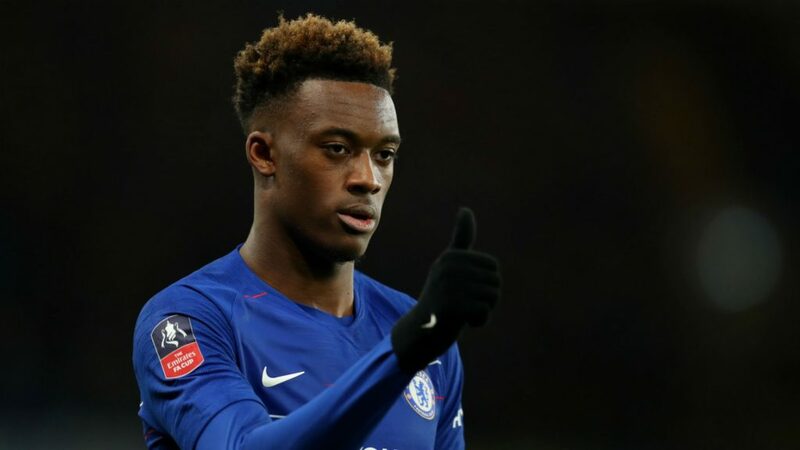 The Stanford Bridge club has blocked the transfer and offer Callum Hudson-Odoi an extension on his contract. The modern football game prioritizes versatility. Hudson-Odoi has shown to be able to play both as a winger, equally comfortable on the left and right flanks, as well as a classic striker. This, coupled with his innate skill, can grant him more opportunities of finding a place in Chelsea or Bayern’s starting line-up. His age also means that the player may still be groomed and specialized for a role that will benefit his side. One of Hudson-Odoi‘s greatest abilities is that of playing behind defenders, and use his pace and athleticism to reach passes. The player usually likes to cut in from the sides. Hudson-Odoi has shown that he can handle his own in duels with experienced central defenders. Hector Bellerin learned this in Chelsea’s defeat to Arsenal. Because of his pace and tactical awareness, Hudson-Odoi can prove extremely beneficial not only in creating scoring chances for himself. The player can prove a great supplier of killer passes to Eden Hazard or Gonzalo Higuain at Chelsea. If Bayern’s offer is accepted, he could do the same for Robert Lewandowski in Munich. The Englishman has scored twice and provided one assist this season, yet we feel he is capable of more. Hudson-Odoi is a rare example of a young player already comfortable in 1v1 duels against more experienced players. When on the ball, the winger uses his pace and vision, to destabilize defenders. He then creates space for a forward pass to his teammate, before lunging himself in attack for a one-two pass. Given Bayern’s history with players, this is likely to be one of the traits the Germans’ scouts have singled out. The winger’s record in terms of passing is indeed a brief one but should make Maurizio Sarri take notice of the player. Callum Hudson-Odoi has a 90% success rate in his Europa League matches. His Premier League performances don’t stray far either. What is more interesting is what he can do when he does pass the ball. Hudson-Odoi is able to move and pass in tight areas. His intelligence makes him seek out difficult and useful passes that can out his teammates in a dangerous position. Often, he will try to move closer to the nearest defender before making the pass. His pace and vision mean that by doing this he can easily take out a defender before making a run or setting up a teammate. Hudson-Odoi averaged 3.5 dribbles per game in the Europa League this season. Does Hudson-Odoi have any important weaknesses? It is difficult to identify any glaring deficiencies in the player’s abilities. Hudson-Odoi is gearing up to be a well-rounded player capable to play on a large stage. Maurizio Sarri has hinted towards a few areas in which he may still improve. Those areas include physical fitness, tactical awareness and the ability to take on extra defensive responsibilities. The player must also earn experience. But, this is, of course, something that can only be obtained by playing often and being offered continuous new challenges. Many would argue that at 18-years-old Callum Hudson-Odoi displays maturity beyond his years. We are to see how the Callum Hudson-Odoi saga plays out. Bayern has made it publicly clear that they wish to transfer to the talented winger. It’s certainly a gesture of intent. On the other hand, Chelsea looks unwilling to sell. 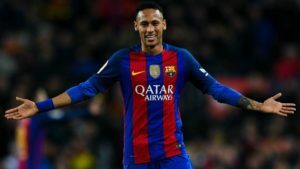 Recent reports that the club could risk a transfer ban in the future may also affect the player’s role in the organization. Until then, Hudson-Odoi remains a free option in FootballCoin. He can be used both in Europa League and Premier League contests. 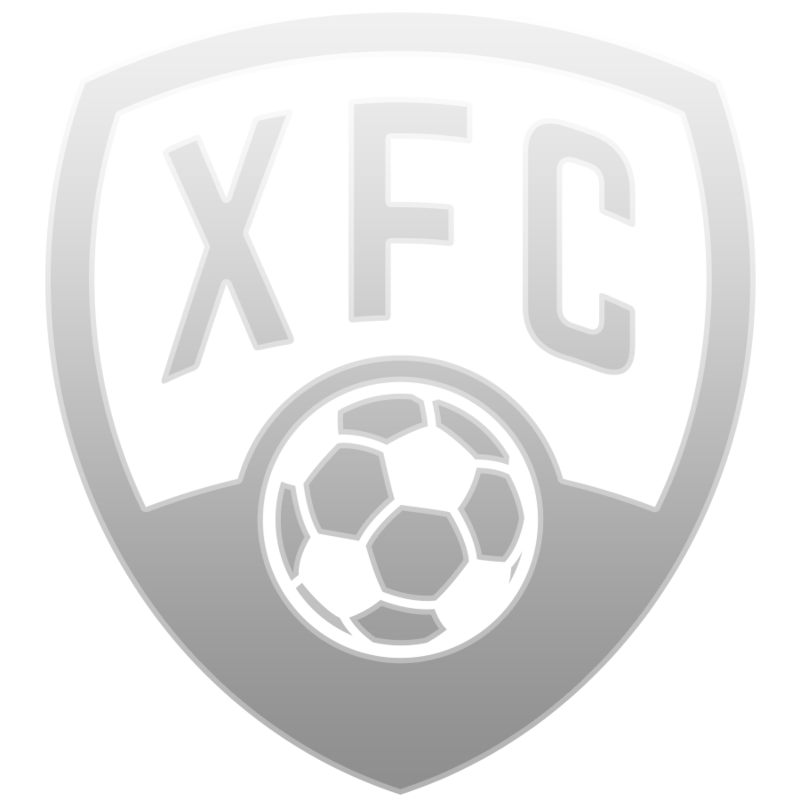 Don’t forget to foin FootballCoin for a free fantasy football game that rewards its very best with cryptocurrency prizes. Chelsea manager Mauricio Sarri denies plans to allow Callum Hudson-Odoi leave the club either in the winter or the summer break. Sarri says that Hudson-Odoi’s transfer request has been rejected. The manager also commented, that despite interest from Bayern Munchen, the player must learn to respect the club and its youth academy. “He has time. 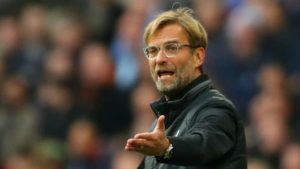 This is his home – we will be patient,” the manager says. Chelsea succumbs to a shocking 4-0 away loss to Bournemouth. In spite of initial reports, Callum Hudson-Odoi is not included among the first team. The winger is also denied the chance to enter the game as a substitute. In light of the result, fans question Maurizio Sarri’s decision. “We have four wingers, one had to be in the stands,” is the manager’s explanation. The transfer deadline in England has passed and Callum Hudson-Odoi continues to be registered with Chelsea. Despite Bayern Munchen’s best efforts, the Blues could not be persuaded. Criticism has followed the decision, with some comparing his situation to that of Jordan Sancho who plays for Dortmund. Sancho’s move to the Bundesliga had a positive effect on both player and club. 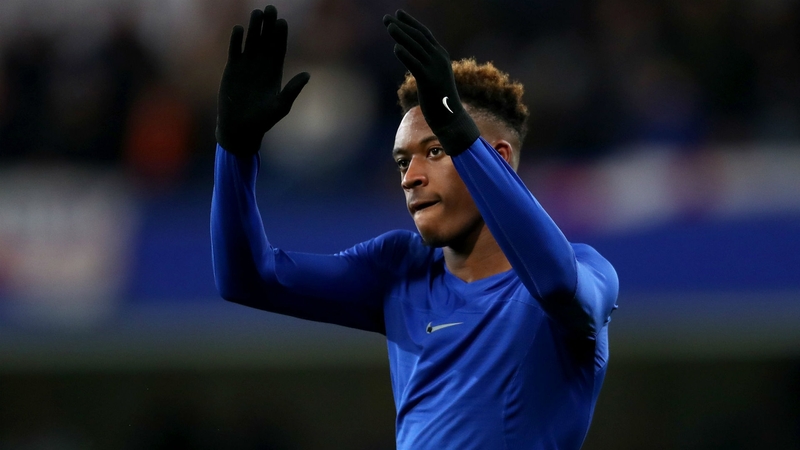 Some claim that the decision to refuse Hudson-Odoi’s transfer request may hinder his development. In spite of the controversy related to Hudson-Odoi’s transfer request, the player continues to be offered few chances to play. The winger played merely 13 minutes during the Premier League fixture against Bournemouth. Chelsea won by a comfortable 5-0 scoreline. Yet, Callum Hudson-Odoi failed to make much of an impact, unable to truly get into the rhythm of the game. It remains to be seen if future matches will provide more opportunities. While Hudson-Odoi remains at Chelsea, more often sidelined, another of his young teammates looks likely to make the leap to the Bundesliga. It has been reported that Tammy Abraham could soon leave for Germany. The interest of German clubs has been influenced by the unexpected rise of British youth player, Jadon Sancho. The 21-yeard-old, Abraham, is currently on loan with Championship side Aston Villa. Elsewhere, Hudson-Odoi appeal for a transfer may have taken another dent. The prospect of Chelsea facing a transfer embargo has become all the more realistic. As things stand, the London side seems unlikely to part with the player, seen as a strong back-up for the first-team. The Europa League is starting to prove to be Callum Hudson-Odoi’s stomping ground. The striker scored in Chelsea‘s 3-0 victory, against Dynamo Kiev. While Hudson-Odoi has rarely featured in the Blues’ squad in the Premier League, Maurizio Sarri has often included in his squad for the Europa League. This is the youngster’s third straight goal at home in the UEL competition. Hudson-Odoi scored in the dying stages of the game, from a pass delivered by another of Chelsea’s young stars, Ruben Loftus-Cheek. While playing time is still uncertain, clearly, Hudson-Odoi’s star is on the rise. Here are his FootballCoin stats from the Europa League. The Europa League is proving to be the stomping ground of top players, condemned to the substitute bench. The talented Callum Hudson-Odoi made another appearance in the UEL last night. Once again, the striker scored for Chelsea. The London side earned an easy 5-0 victory over Dynamo Kiev. Chelsea advance to the next round with an 8-0 aggregate score and remain tournament favorites. Hudson-Odoi was joined by a host of Chelsea stars, rarely featured in Premier League games. 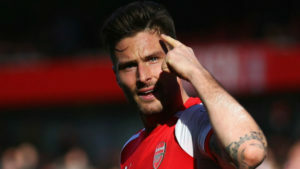 Brightest of all shone Olivier Giroud. The Frenchman, criticized in the past year for his lack of efficiency, scored a hat-trick. Here is how Chelsea lined up. Could some of these players find their way into the first team for next season? Manager Maurizio Sarri was uncharacteristically complimentary of his players, including of Callum Hudson-Odoi. “He played very well — better in the second half because we found the spaces and Callum in the spaces is really a very good player. I’m happy for him, but he has to keep the feet on the ground because he can improve more,” Sarri told ESPN. Hudson-Odoi is happily surprised to be included in England’s senior national squad for the upcoming set of features. This, despite not yet having made his debut for the Under-21 squad. Callum Hudson-Odoi has only played 119 minutes in the Premier League but has impressed with his performances in the Europa League. England is due to play the Czech Republic and Montenegro in the Euro 2020 qualifiers. It remains to be seen if Hudson-Odoi will be given much time on the pitch. Regardless, it is a great success for the youngster. The striker announced his intentions to leave Chelsea for Bayern Munchen this winter. Stamford Bridge officials blocked the move citing his potential importance to the squad. Hudson-Odoi is once again involved in the news. This time, sadly, is for suspected abuse the player may have received from Dynamo Kiev in the recent Europa League match. It has been reported that Chelsea has launched a formal complaint to UEFA. The incident took place towards the final stages of the match. Callum Hudson-Odoi made Chelsea captain Cesar Azpilicueta aware of the situation. The issue was then reported to a UEFA delegate. An investigation has been launched into the matter. If the issue is confirmed, the Ukrainian club may risk a fine and/or suspension. There is without a doubt at least one manager thrilled enough with Hudson-Odoi. Enough so as to start him in an important match. The manager in question is England boss Gareth Southgate. The Three Lions’ tactician talked about the young striker ahead of the Euro qualifier match against the Czech Republic. Southgate compared him favorably to Dortmund’s young star, Jadon Sancho. The manager went on to say that he would see no reason not to offer Callum Hudson-Odoi a starting place on the team. Addressing the striker’s lack of playing time in the Premier League, Southgate did not seem worried. The manager says that this is merely due to the pecking order, that includes established players like Eden Hazard. Words of high praise indeed. As things stand at the moment, Hudson-Odoi looks likely to make an appearance in tonight’s qualifier game, albeit, likely as a substitute for Sancho or Harry Kane. Callum Hudson-Odoi becomes England’s youngest ever debutant in a competitive game. It was a record that had held for 64 years. Hudson-Odoi was introduced as a substitute in the Euro 2020 qualifier match against the Czech Republic. The winger nearly got the chance to score on his debut, as well. His shot in the 84th minute was deflected by Tomas Kalas into his own net. Following the performance, the British sports press has not hesitated to heap praise upon Hudson-Odoi for his impressive debut match. Hudson-Odoi makes his full debut for England in the match against Montenegro. The winger makes quite an impact running the opposition’s defenders ragged. The sports press praises the youngster’s technique and fast pace. Indeed, watching the game it feels at one stage that the Montenegro players simply give up on challenging for the ball when Hudson-Odoi is in possession. It ends with England winning 5-1 away. Naturally, the British press is ecstatic about the run of results. Hudson-Odoi is well on his way to establishing himself as a serious contender for a starting position in the Three Lions’ side. With that being said, it should be noted that his presence on the field was helped by the absence of Jardon Sancho, out through injury. Hudson-Odoi is rated highly for his attacking prowess. The one weak spot pointed out by journalists is his relative inexperience in defensive situations. The winger’s loss of the ball in the early stages led to Montenegro’s opening goal. On the upside, Hudson-Odoi seemed unperturbed by the occurrence and his performance improved going forward. It’s impressive progress for Callum Hudson-Odoi. The Chelsea winger has now made his full debut for England, before getting to start for his side in the Premier League. As things stand, Bayern remains in pursuit of the player. But, Chelsea seems unwilling to budge. Will Hudson-Odoi’s excellent form, force manager Maurizio Sarri to offer the promising youngster more playing opportunities? Callum Hudson-Odoi finally makes his first ever start for Chelsea in the Premier League. It arrives following good performances for England. The winger had been given his debut for the national team in the week prior. Fans of the Blues have long been calling for Maurizio Sarri to consider making changes to his selection. Their biggest qualm is the lack of inclusion of Hudson-Odoi. Against Cardiff, the youngster did not disappoint. 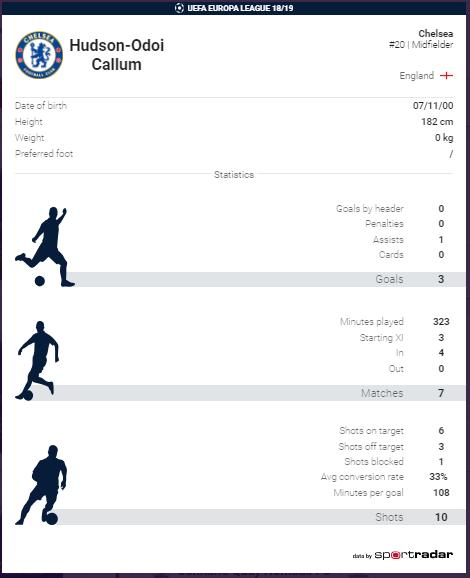 Highly active throughout the game, Callum Hudson-Odoi used his dribbling skills to great effect. It ended 3-0 for Chelsea. Despite the victory and Chelsea’s current third position in the league table, the situation is far from being a serene one. Maurizio Sarri’s job may be in peril come the summer, if reports are true. Regardless, with growing interest for Hudson-Odoi, it seems ever less likely that the London club’s board will agree to offload the player. The Blues are involved in the Premier League battle for a place that would book them entry in the Champions League., Chelsea is also the heavy favorite for winning the Europa League. Hudson-Odoi has been involved in many of Chelsea’s matches in UEL. Here, he has also managed to score on several occasions. Devastating news for Hudson-Odoi, as the winger is rushed off the field during Chelsea’s 2-2 draw against Burnley. The England international is provided a worrying diagnosis. Callum Hudson-Odoi has raptured his Achilles tendon. It now looks like the youngster will be out of contention for the rest of the season. Sad news indeed, especially given Hudson-Odoi recent rise in form and the increased playing opportunities for both England and Chelsea. If the initial diagnosis is confirmed, the winger may miss as much as six months while he attempts to regain fitness. The young star will be anxiously awaited back on the team by Chelsea’s supporters. Giroud unlikely to leave, but will Arsenal sign an additional striker?